Are you interested in becoming a Lady and Sister of Alpha Phi Gamma? 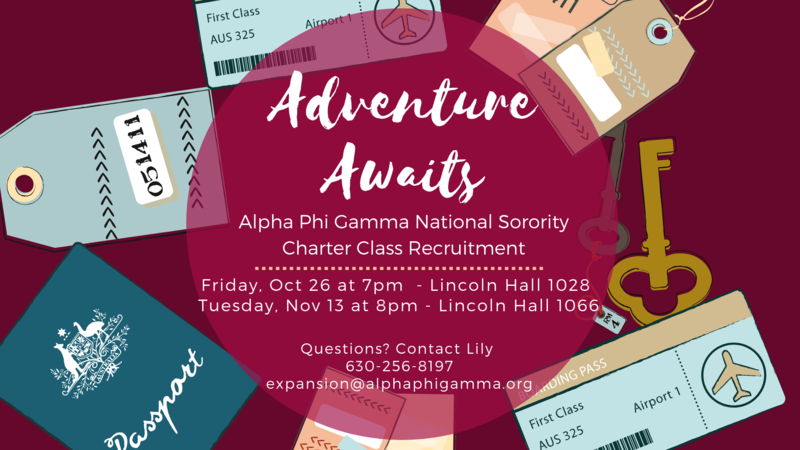 Alpha Phi Gamma National Sorority Inc. is coming to the University of Illinois at Urbana Champaign to recruit those interested in bringing our Authentic and Real Sisterhood to campus. Events will be hosted throughout the Fall and Spring semester. Click on the link below if you are interested in learning more and for the latest information about recruitment! Recruitment is a time during the beginning of the school year in which students interested in being involved on campus can come out and get to know Alpha Phi Gamma as well as other Greek Organizations on campus. Students who attend recruitment events learn about our organization’s Sisterhood, Service/Philanthropy, Personal Development, and Academic Excellence. Alpha Phi Gamma Sorority, Inc. Is an Asian interest sorority, however, WE ARE NOT AN ASIAN-Exclusive Sorority. We continue to provide Asian Awareness to the university and the surrounding community and promote academic excellence, personal development, and leadership. The purpose of Alpha Phi Gamma is to bring together all women of different nationalities through bonds of friendship and sisterhood. Alpha Phi Gamma exists to provide service and Asian Awareness to the University and surrounding communities for the betterment of society. It promotes scholarship and academic excellence, personal development and leadership. ALL RECRUITMENT EVENTS ARE COMPLETELY FREE AND NON-OBLIGATORY!